I must admit I have not personally grown this cultivar but was first introduces to it when reading Roy Diblik's book The Know Maintenance Perennial Garden. He is a noted plants-man that designs lush, gorgeous, but low maintenance gardens. He actually started the gardening trend of using plants that work well with each other without a lot of gardening maintenance. He uses Stachys 'Hummelo' in several of his designs. He raves about the clean and strong foliage and the beauty of it the moment it emerges in April, because it is glossier than straight Stachys. It starts to bloom rich saturations of purple in late June and ends in September turning an attractive brown. The flowering spikes are two to three inches, held six to eight inches over the foliage. However, removing faded flowers will encourage more buds to form for weeks on end. Diblik uses these in his sun garden locations, mixed with plants like prairie drop seed, perennial salvia, coreopsis, blue indigo, coneflower, perennial geranium, moor grass. He uses them in shade gardens mixed with plants like sedges, perennial geranium, eastern wood aster and autumn moor grass. 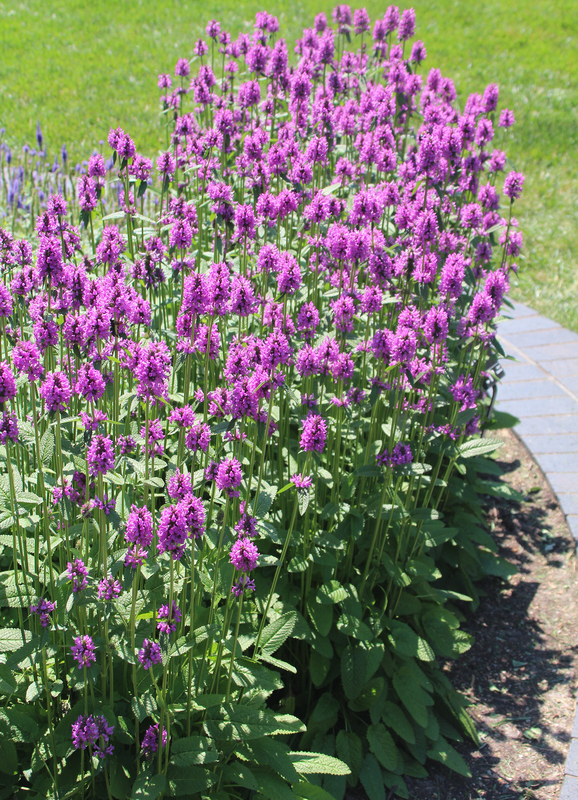 Stachys, Wood betony, requires additional watering during establishment period but afterwards becomes drought resistance and covers the ground in a short period through spreading stolons providing remarkable flower display especially when in masse. Martha Smith, horticulture educator for University of Illinois Extension and perennial guru says, "Hummelo is hardy throughout all of Illinois and deserves and space in your sunny border." 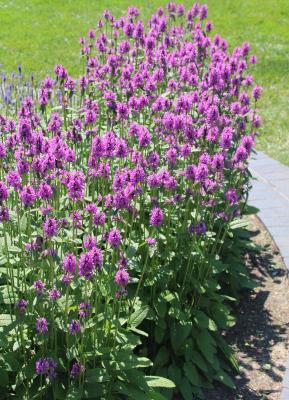 Smith adds Stachys'Hummelo' received the highest rating out of 22Stachysstudied in the Plant Evaluation Trials at the Chicago Botanic Garden. The trial ran from 1998 through 2004. It received this rating based on strong flower production, plant health, overall good growth habit and winter hardiness. Go with the professionals. Plant the 2019 perennial plant of the year this spring, be a successful gardener with little effort, and make the neighbors comment.